Edges and openings of woods and forests, thickets, streambanks, trails, roadsides. This is 8″ to 48″ tall, erect, perennial forb that rises on 1 to 3 or more clustered stems from a long rhizome and sometimes also a branched caudex. It often forms colonies or dense tufts. 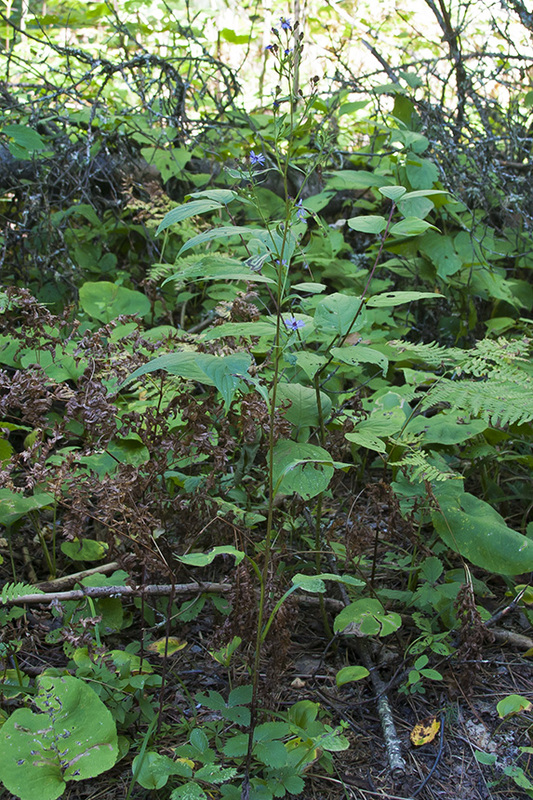 The stems are erect and straight or somewhat zigzagged. They are almost hairless or sparsely hairy below the inflorescence, sparsely hairy in the inflorescence. Basal leaves are on long, slightly winged leaf stalks. The blades are thin, egg-shaped, usually 1½″ to 4¾″ long, sometimes longer, and ⅝″ to 2¾″ wide. They are usually shallowly heart-shaped, sometimes rounded, at the base, and taper to a point at the tip with straight on concave sides along the tip. The upper surface is hairless or rough to the touch due to the presence of short, stiff hairs. The lower surface is usually densely hairy along the midvein, otherwise sparsely hairy to almost hairless. The margins are coarsely toothed with sharp, forward-pointing teeth. Basal leaves are usually withered at flowering time. Stem leaves are alternate. Lower stem leaves are on long, winged leaf stalks. The blades are thin, egg-shaped, lance-shaped, or inversely lance-shaped, 2⅜″ to 6″ long, and ¾″ to 2⅜″ wide. They are usually shallowly heart-shaped, sometimes wedge-shaped, at the base, and otherwise similar to basal leaves. Lower stem leaves are often withered at flowering time. Stem leaves become gradually smaller, less toothed, and shorter-stalked as they ascend the stem. 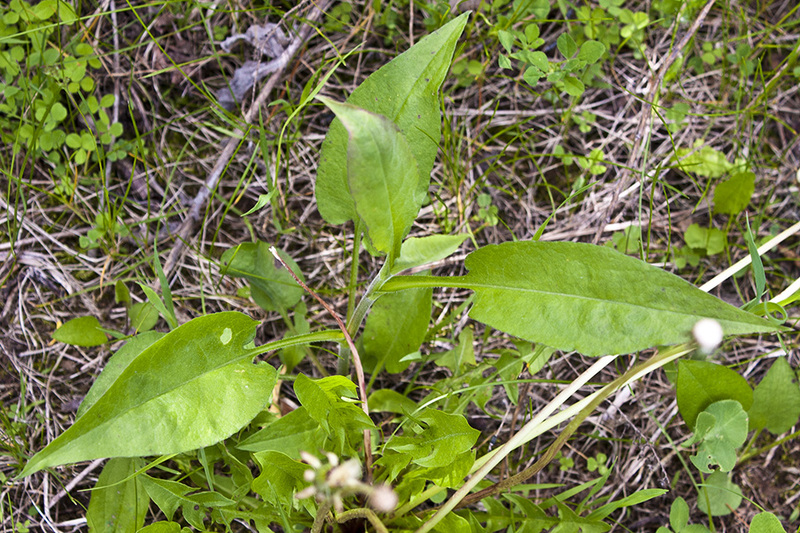 Upper stem leaves are on short, widely winged, leaf stalks. The blades may be egg lance-shaped, narrowly lance-shaped, or linear, ¾″ to 3″ long, and 3 ⁄16″ to 1″ wide. They are wedge-shaped at the base and sometimes somewhat clasp the stem. The margins are minutely toothed. They are otherwise similar to lower stem leaves. The uppermost leaves are stalkless and untoothed. The inflorescence is an open, branched cluster (panicle) at the end of the stem. The branches of the panicle are ascending. 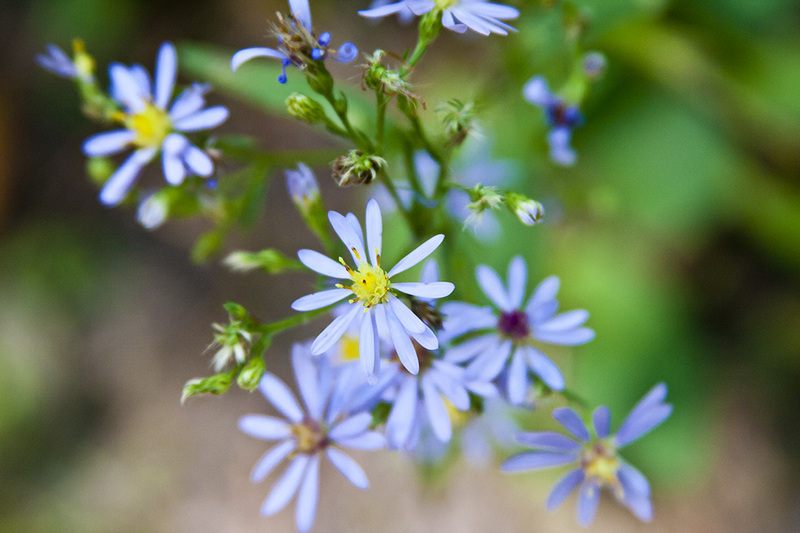 There are usually 13 to 50 flower heads, rarely more than 100. The flower heads are on 1 ⁄16″ to ⅝″ long stalks. Each flower head is 1″ to 1½″ in diameter. The whorl of bracts at the base of the flower head are arranged in 4 or 5 overlapping series and form a bell-shaped, 3 ⁄16″ to ¼″ long cup (involucre). The involucral bracts are usually hairless but sometimes have a fringe of hairs on the margin. There are 14 to 20 pale to deep blue or bluish purple ray florets and 14 to 25 disk florets. The disk florets are yellow at first, eventually becoming reddish-purple. The fruit is a dry achene (cypsela) with white to pinkish bristles attached.